i am not actually (maybe that will change) in the market for a cocoquantus but with another sid in my future, replicating (as a game in my head) my old setup has been entertaining me as i move through my day. i thought it might be fun to share peoples ideas about how to roughly replicate the cocoquantus through the use of different instruments/formats or what have you. keep in mind, this is totally just for fun and maybe educational in terms of breaking down the cocoquantus. That's a tough one, I love the sound quality. The red panda particle is awesome with Sid I have also been using a marantz pmd cassette with endless tapes, these are great with 2 speeds and pitch control. 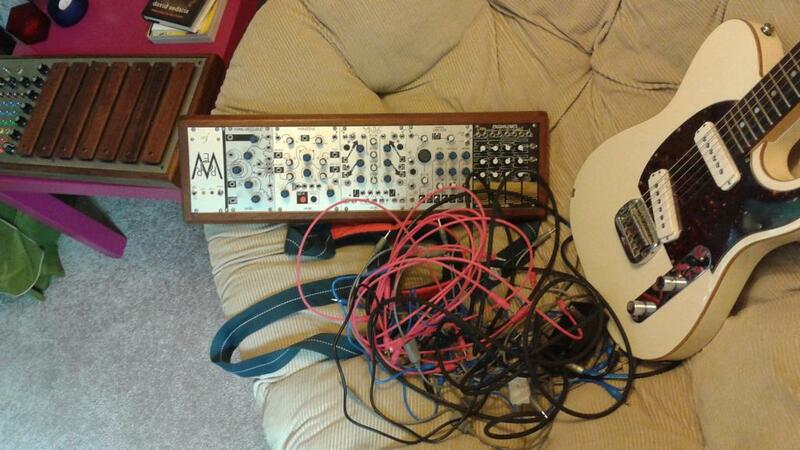 Another fun device is the Martin Howse Black Death synth, I specified more sampling and less plague code. is that coltrane my fav things being 'treated'? wow that monome device would be amazing as dedicated hardware. really gorgeous! i am thinking of a hifi modcan knockoff concept. maybe modcan b series (i would do a pic if i could get the software going again but it isn't working. dual vca. could get ducking stuff going on with bipolar cv ins. could go crazy on the deep end...cv mixers scanner/ s/h or miniwave for latchings and 8 bits. I've never had anything that approximates the workflow. I suppose that one can go through contortions with other gear, but I don't think that you'd get this aspect of it. Ultimately it seems like the same question that is frequently asked - how do I emulate THIS piece of gear with other equipment. Generally the answers ignore workflow. Two Phonogenes, a Benjolin and some utilities including a dual VCA for AM would be an interesting variation of Coco functionality me thinks. i completely agree. just having a little game. but I dig the modcan idea for faking it in HiFi, I sort of do already w/ the 59a...Liam had me thinking & though I've never used the mungo g0, I did bring it up to him, so could you euro cats chime in? would it also be a new, fun, elaborate version, take on coco? Basically what scanner said but replace phonogenes w/ g0's? ...Again, all about a good time, not a serious replacement. Jus' foe phun. It all depends on what you mean by emulation. My Quantisise project can emulate the Quantussy oscillator architecture, which it is based on. The workflow is entirely different, though, using patch cords and switches for routing. The chaos function is similar, but different. The VCOs have one wide range instead of three overlapping ranges. It might be better to say my project pays homage to the Cocoquantus. I agree it would be difficult to implement Cocoquantus functionality close enough especially with how the different parts interact and influence each other. To me the main defining qualities of Coco are the delay core with ability to lock a sample and flip/skip it and CV delay time, so Phonogene seems like a good fit for that, and quantussy as a chaotic modulator and a potential sound source, Benjolin seems to have similar qualities, especially the Rungler part with one oscillator sampling the output of another. Should probably add touch plates as well to replicate the node interaction. I actually build a PD object that replicates the timing algorithm of the coco as a phasor. This way it can drive not just loops/ delay lines but also sequencers, wave table oscillators and generally anything else that uses a phasor. Oh yeah and you can sync it to a clock . I haven't released it because I haven't compiled it for windows or Mac (only Linux) but I could release the code and then others could maybe compile it and we could stick it all into the same package. All this came from awhile back when I wrote a max patch that basically emulated the cocolase (original model) but which was not 100% accurate in the skip department due to the phasor~ object only resyncing on the asynchronous clock through messages and not signals. I had to use a feedback SAH patch which means using a small block size and sometimes high sampling rate if you don't want it to freak out (which is also fun sometimes). Also willing to share that. Obviously nothing replaces fiddling with the box yourself but I like the digital versions for different reasons than the analog one now that I finally have my hands on on it. Oh yeah rod that mono me patch sounds amazing! Is there some sort of block diagram of cocoquantus architecture? It would be very helpful. Does anyone have specifics on the timing algorithm? Anyway, what about the 2 coco samplers? Have they special features or are they just in the range of phonogene/g0/nebulae? there is also a green input (which looks more like it is part of the middle section but they are for the coco's) per side next to the loop/delay toggle. The input will toggle on and off depending on the voltage at the input. I haven't really done much CV looping with the CQ2 but it seemed to work well on the original. This I find intriguing does anyone know if this is something that could be added to the Coco2? If the circuit is still on the board but just not brought out? @adolf do you see the big barred sidrax that sits on the table? That is also a Ciat lonbarde I would imagine that can be used as a sort of quantussy except it has seven voices instead of five with a few other differences. do you use max/msp at all? if so rodrigo (who I haven't seen on here or on the monome forums for a while ) made an excellent monome centric cocolase emulation. It is a bit different than a cocoquantus but you could get your hands/ears dirty. I really wanted a cocoquantus after playing with monolase.